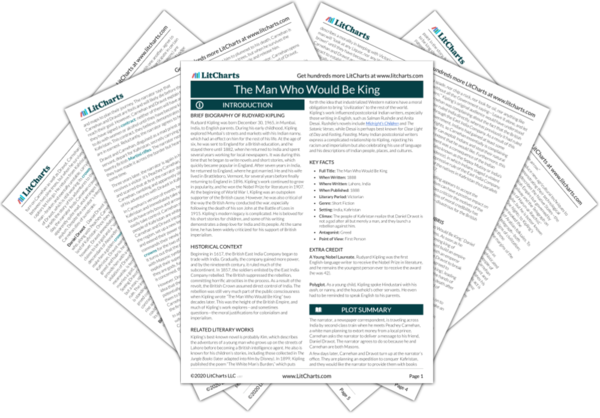 Instant downloads of all 946 LitChart PDFs (including The Man Who Would Be King). Welcome to the LitCharts study guide on Rudyard Kipling's The Man Who Would Be King. Created by the original team behind SparkNotes, LitCharts are the world's best literature guides. A concise biography of Rudyard Kipling plus historical and literary context for The Man Who Would Be King. A quick-reference summary: The Man Who Would Be King on a single page. In-depth summary and analysis of every of The Man Who Would Be King. Visual theme-tracking, too. Explanations, analysis, and visualizations of The Man Who Would Be King's themes. The Man Who Would Be King's important quotes, sortable by theme, character, or . Description, analysis, and timelines for The Man Who Would Be King's characters. 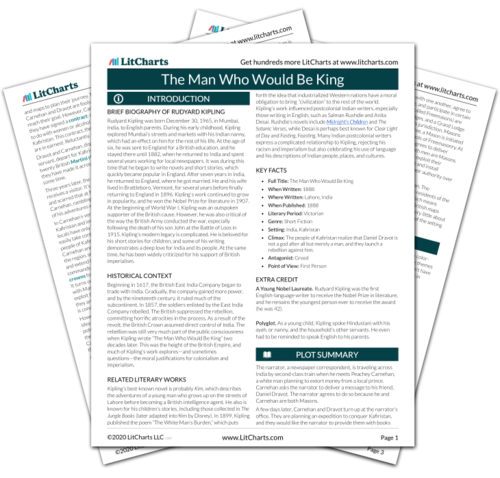 Description, analysis, and timelines for The Man Who Would Be King's terms. Explanations of The Man Who Would Be King's symbols, and tracking of where they appear. An interactive data visualization of The Man Who Would Be King's plot and themes. Rudyard Kipling was born December 30, 1965, in Mumbai, India, to English parents. During his early childhood, Kipling explored Mumbai’s streets and markets with his Indian nanny, which had an effect on him for the rest of his life. At the age of six, he was sent to England for a British education, and he stayed there until 1882, when he returned to India and spent several years working for local newspapers. It was during this time that he began to write novels and short stories, which quickly became popular in England. After seven years in India, he returned to England, where he got married. He and his wife lived in Brattleboro, Vermont, for several years before finally returning to England in 1896. Kipling’s work continued to grow in popularity, and he won the Nobel Prize for literature in 1907. At the beginning of World War I, Kipling was an outspoken supporter of the British cause. However, he was also critical of the way the British Army conducted the war, especially following the death of his son John at the Battle of Loos in 1915. Kipling’s modern legacy is complicated. He is beloved for his short stories for children, and some of his writing demonstrates a deep love for India and its people. At the same time, he has been widely criticized for his support of British imperialism. 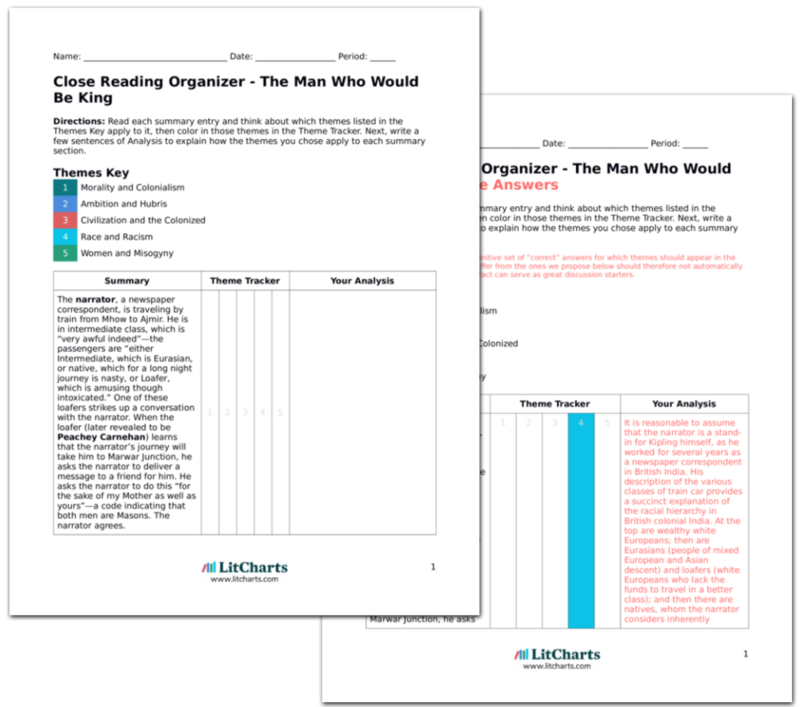 Get the entire The Man Who Would Be King LitChart as a printable PDF. Beginning in 1617, the British East India Company began to trade with India. Gradually, the company gained more power, and by the nineteenth century, it ruled much of the subcontinent. In 1857, the soldiers enlisted by the East India Company rebelled. The British suppressed the rebellion, committing horrific atrocities in the process. As a result of the revolt, the British Crown assumed direct control of India. The rebellion was still very much part of the public consciousness when Kipling wrote “The Man Who Would Be King” two decades later. This was the height of the British Empire, and much of Kipling’s work explores—and sometimes questions—the moral justifications for colonialism and imperialism. Kipling’s best-known novel is probably Kim, which describes the adventures of a young man who grows up on the streets of Lahore before becoming a British intelligence agent. He also is known for his children’s stories, including those collected in The Jungle Books (later adapted into film by Disney). In 1899, Kipling published the poem “The White Man’s Burden,” which puts forth the idea that industrialized Western nations have a moral obligation to bring “civilization” to the rest of the world. Kipling’s work influenced postcolonial Indian writers, especially those writing in English, such as Salman Rushdie and Anita Desai. Rushdie’s novels include Midnight’s Children and The Satanic Verses, while Desai is perhaps best known for Clear Light of Day and Fasting, Feasting. Many Indian postcolonial writers express a complicated relationship to Kipling, rejecting his racism and imperialism but also celebrating his use of language and his descriptions of Indian people, places, and cultures. Climax: The people of Kafiristan realize that Daniel Dravot is not a god after all but merely a man, and they launch a rebellion against him. A Young Nobel Laureate. Rudyard Kipling was the first English-language writer to receive the Nobel Prize in literature, and he remains the youngest person ever to receive the award (he was 42). Polyglot. As a young child, Kipling spoke Hindustani with his ayah, or nanny, and the household’s other servants. He even had to be reminded to speak English to his parents. Marcuson, Tim. "The Man Who Would Be King." LitCharts. LitCharts LLC, 21 Nov 2018. Web. 11 Dec 2018. Marcuson, Tim. "The Man Who Would Be King." LitCharts LLC, November 21, 2018. Retrieved December 11, 2018. https://www.litcharts.com/lit/the-man-who-would-be-king.